Now I know a lot of you cringe at the thought of covering beautiful fresh ingredients like eggplant and leek in cream and cheese…but I’m not trying to hear that. This is a lovely and decadent dish, packed with flavor and beautifully presented. Try it out for your next holiday dinner party or a cozy night at home. It makes a beautiful vegetable side dish and is perfect with roasted or grilled meats… and even seafood. Enjoy! Blot the salted eggplant before frying. Prepare a large baking sheet lined with paper towel. Slice your unpeeled eggplant into 1/2” thick rounds. 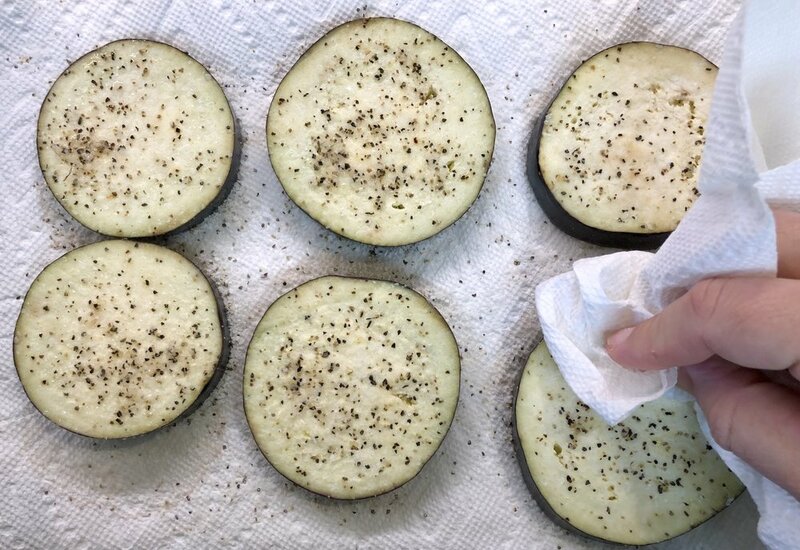 Lightly sprinkle the tops and bottoms of the eggplant rounds with Cook’s Line seasoning or Kosher salt. This process not only seasons the eggplant but draws out excess water keeping then more firm and whole while baking. Place the eggplant rounds onto the prepared baking sheet and rest for 15 minutes. For the large leeks, trim the leeks to where the green begins. Slice the leeks in half, then cut into half moons. Place the cut leeks into a bowl of cold water and wash removing any grit. Drain and rinse again if needed… the sand will sink to the bottom. Remove the cut peels and shake dry. For the smaller leeks trim the leeks once more to the green stalk. Cut lengthways in half. Rinse order cold water washing out any trapped sand and grit. Pat dry. In a large heavy bottom skillet, add enough grapeseed oil to cover the bottom 1/2” deep. Heat until the oil shimmers and add the eggplant rounds. Be sure not to overcrowd the pan, it’s okay to do in batches. Fry the eggplant on both sides until golden brown. Place the fried eggplant back onto the baking sheet. In the same pan add the butter and melt. To the pan add the sliced half moon leeks and cook until tender. Sprinkle in the chopped fresh thyme and cook in until fragrant. If using the same skillet for your gratin, add the fried eggplant on top of the cooked leeks. If using a shallow casserole or large gratin dish add the cooked shallots to the bottomed layer in the eggplant. Fit in the six long cut smaller leeks in between the eggplant rounds, flat side down. Preheat your oven to 425 degrees. In a mixing bowl add the ricotta cheese, egg, heavy cream, and nutmeg. Mix until smooth with a hand whisk. Pour the mixture on top and all around to coat the entire dish. Add the grated gruyère cheese on top for a nice even top layer. Place the pan or dish into the oven and bake for 12-15 minutes until golden brown and bubbling. Remove the pan and serve right away.